Olivia Jameson runs a summer camp called Breathe, giving inner-city kids a chance to see a different life. When the man who owned the camp died, leaving his dream to his son, Liv took charge, and the work means the world to her. As far as Alex Campbell is concerned, the camp is a hands-off tax write-off. But when Liv calls because her boys are accused of property damage, Alex returns to the place he hasn't called home since age twelve…and to a girl he barely remembers, now a woman who stirs him like no city sophisticates ever have. This is Liv's livelihood, her mission, her dream. Sharing it with a man who doesn't understand the impact is frustrating. But as he begins learning truths that were hidden from him, both Liv and Alex may have a change of heart. Can Liv open up her life one more time to love? 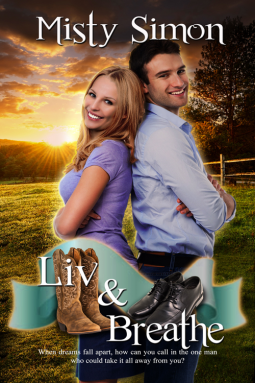 Liv and Breathe is my first read by Misty Simon, and while I found the author’s writing style easy to follow, and I liked that the story was a quick, standalone novella length book, I did have trouble warming to Liv’s character and struggled at times maintain my interest. But that said, there was a happily ever after and a strong epilogue, and the book was done in a couple of hours, so it wasn’t to hard to finish. I have never read anything from this author so I didn't know what to expect. This subject matter was not something I have read about before or that I can remember. The author gave the book a down home feel to it. The town comes together to help kids who are less fortunate, but it seemed more like they were helping Olivia and her son because they believed in her and what she was trying to do. Olivia had this passion for what she was doing and she was super stubborn and would let nothing stop her. Alex has this feel about it at first that made you wonder will I end up liking this guy in the end or not. He had this soft side to him but he also kept his guard up a lot of the book. Over all this book is a decent read. There are adult situations described but not graphic. I would say if you are looking for a fun read with a lot of sass then defiantly check this read out.